It’s supposed to be spring but Muskoka didn’t get the memo. The great thing about being a runner is that we run in spite of the weather conditions, and sometimes to spite the weather. 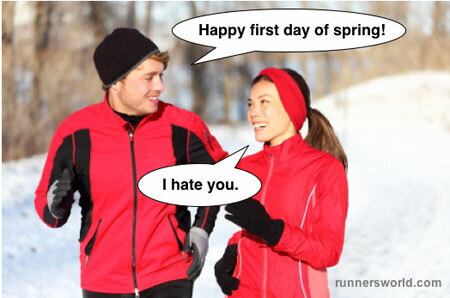 As MARS prepares for its first organized run, tomorrow (Tuesday April 2) from 6:30-7:30 am at the Conroy Track, we thought we might inspire you with some running quotes, some specifically about lousy weather! This entry was posted in Scheduled Runs and tagged Quotes, Running. Bookmark the permalink.